HMV XLP 30011 1963 LP/matrices: 2XEA2281 -1N / 2XEA2282 -3N Recorded: 6/7 Dec.1951 & 24 Dec.(Nov.?)1953. 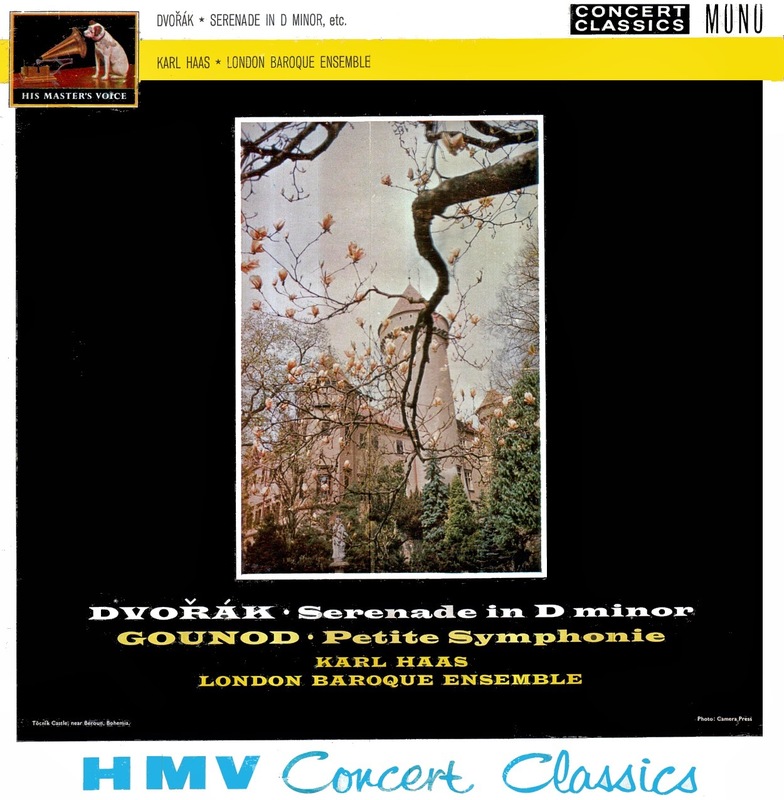 With the exception of the PYE Strauss/Arnell/Kay (have an awful cassette) they otherwise recorded for Parlophone Strauss' Wind Symphony (have the original:that the only other XLP reissue) - and possibly sounds better there - as EMG mentioned this Dvorak XLP was much better than the 10" LP). So apart from the Beethoven/PYE + Schubert's Konzertstuck (have both) - everything else appears 'Baroque-era' on Westminster/Parlophone (only have one Westminster -but most Parlophone) and almost completely neglected in terms of CD reissue. This is a very nice LP - deleted within a couple of years (Barbirolli's same coupling is also very good/sounding on PYE CCL - also the 1967 GSGC stereo G.Guinea). I did upload this Gounod in 2009 - possibly also the Dvorak - but these should be 'near-flawless'.. Thank you very much. Here's what Warren LaMotte said in "The Long Playing Record Guide"
"A most engaging work, beautifully played and recorded with clarity"
Have added the (rather inconsequential) EMG review. 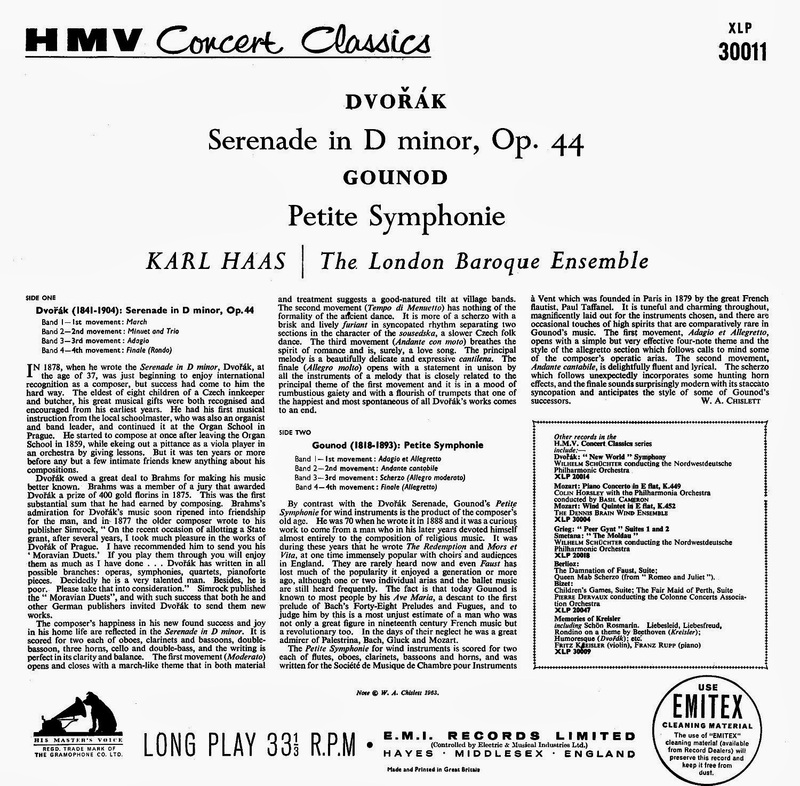 There is better clarity than in most of the (very early..) Haas Parlophone LP's - though the Gounod seems to suffer more from some 'flutter-echo'; presumably Abbey Road? 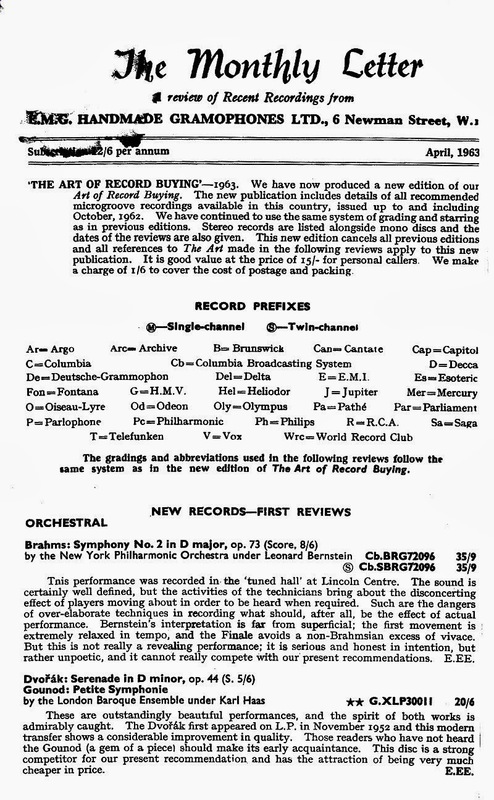 A good coupling - my first was the 1971 de Waart/Netherlands Wind Ens. Philips LP..though I don't have the earlier Decca LXT - which was superseded, according to EMG, by the 1959 Barbirolli (more bucolic in tone-colouring compared to the London players here.).. Wonderful music. Need more be said?? This performance of the Dvorak Serenade is absolutely superior, the Gounod also being excellent. Thanks a lot for this beautiful transfer..
Don't have the original 10" disc (PMB1001) so can't confirm whether it's also 'clipped' there: that transfer would likely be too bad to notice! Have 10 original Haas LP's - not all on CD - and not all are particularly 'successful'.